In a recent news post, the National Corvette Museum has announced that they are seeking to expand their collection by adding the 2004 – 2009 Cadillac XLR. 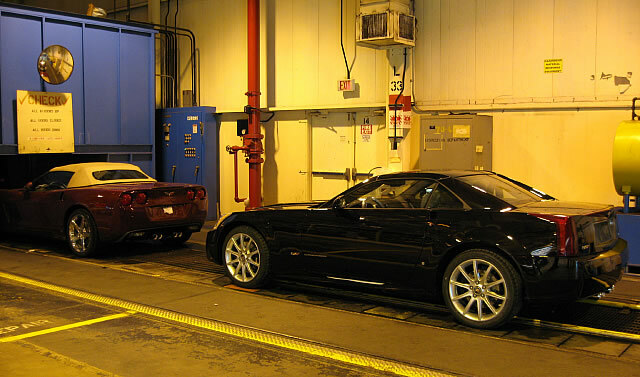 The Cadillac XLR was built from 2004 to 2009 and is the only other automobile to have been built along side the Corvette at the Bowling Green Corvette Assembly Plant. If you are the owner of a 2004 – 2009 Cadillac XLr or XLR-V and would consider donating it to the Museum, please contact the National Corvette Museum’s Curator Derek E. Moore at 270-777-4516 or derek@corvettemuseum.org. The National Corvette Museum exhibits the history of Corvette from its inception to the current year models that leave the GM Bowling Green Assembly Plant daily. To tell the Corvette’s story, the Museum utilizes their artifact and archive collections in the galleries through various model years, significant milestones, technological upgrades and its impact on the automotive world. These goals are accomplished with the help and support of enthusiasts. One of the many great ways enthusiasts can support the National Corvette Museum’s mission is by donating a vehicle to the collection. Although one might think that the Museum only accepts Corvettes, that is not the case! Currently the Museum is looking for several Corvettes to for our collection, as well as other vehicles that have a significant tie to the Corvette story. Below is a ‘wish list’ of vehicles that the National Corvette Museum would like to add to its collection. If you have one of these vehicles and would consider donating it to the Museum, please contact our Curator Derek E. Moore at 270-777-4516 or derek@corvettemuseum.org. 2004-2009 Cadillac XLR, the only car produced in tandem with Corvette and the story of the Corvette platform turned Cadillac sports car. Other GM built vehicles with Corvette engines, e.g., 2006-2009 Chevrolet TrailBlazer SS, 2004-2006 Pontiac GTO, 2004-present Cadillac CTS-V, etc. Pre-Corvette fiberglass sports car, e.g., Glaspar G2, Lancer, Woodill Wildfire, Kaiser-Darrin, etc. Pre-Corvette American sports cars, e.g., Mercer Raceabout, Stutz Bearcat, Nash-Healey, Crosley HotShot, etc. The National Corvette Museum is a 501 (c)(3) nonprofit foundation dedicated to preserving Corvette’s past, present and future heritage. As a member-driven organization, the Museum relies heavily on donations. Learn more about donating your automobile online at https://www.corvettemuseum.org/support/donate-your-automobile/.